Versailles High School "Blue Devils"
Versailles (population 567) is located in lower western Illinois in southeastern Brown County. Illinois Route 99 is the main roadway into Versailles. Route 99 connects Versailles with its neighbor 10 miles to the northwest, Mt. Sterling. The Russett Branch RIver flows into town as well. A town of note near Versailles might be Jacksonville about 20 miles southeast of Versailles. C.B.Reynolds was the Principal at this time, and Thomas A. McCormick the main teacher. 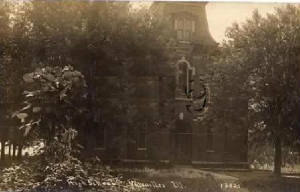 This building housed both grade and high school classes until it was destroyed by fire about 2:30 on the afternoon of November 4th, 1910. The disastrous fire started in the belfry, and soon engulfed the entire building. The winter’s supply of coal and a barrel of coal oil had just been delivered and stored in the basement, adding fuel to the fire. A student wrote in a letter to a friend that some students grabbed the books and threw them out the windows, some grabbed their scarves and sweaters, and others just ran for their lives. The organ, bookcases, clock, maps and some pictures and chairs were also saved. Since it was totally destroyed, school was held in other locations, such as the opera house, churches and private homes around the town for the remainder of the school year. A new brick structure to replace the burnt school opened in October of 1911, although not fully completed at this time. It housed six classrooms, recitation room and two playrooms in the basement. Constructed by Apsey, Fuche & Co. of Monmouth, its cost was $24,000. This was also for both elementary and high school classes. Several additions were made over the next years, including a gymnasium, hot lunch cafeteria, three additional classrooms and indoor playroom. The coal fired steam furnace was converted to natural gas ca. 1965. High school continued as a four year program until 1944 when a three year program was initiated. In 1947 the High school closed and students were bused to Mt. Sterling High School. The school continued with grades K – 8 until the end of the 2003 school year when it was closed and all classes are now bused to Mt. Sterling. The main body of the school was demolished by the school district, saving the gym, cafeteria and three newer classrooms, all in one wing. These were given to the Village of Versailles for the community’s use and now house the Village Library and City Hall." You can check out the Versailles Area Genealogical & Historical Society website at http://vaghs.tripod.com . At some point in the mid 1940s, a consolidation effort of the high school districts in Brown County began. It is probable that Versailles was a part of these talks. Versailles High School joined this effort in 1947. School nickname: the "Blue Devils"
This was an original tune adopted in 1918, written by student Howard Wilson. He won a contest sponsored by the school for best original school song. Judges of the contest were Rev. and Mrs. J. M. Judy and Miss Gladys Turner. Not afraid to take a dare. Just you listen not to what we say. When we start into the game with visitors. For V.H.S. is going to win. It is known that Versailles High School competed in boy's basketball. This is evidenced by their lone season of success as recorded on the IHSA web site www.ihsa.org. It is quite likely the Versailles High male athletes also competed in track and baseball. If you have any further information about Versailles High School's athletic program please e-mail us at eganann@sbcglobal.net. As stated above, only one season is listed on the IHSA web site. 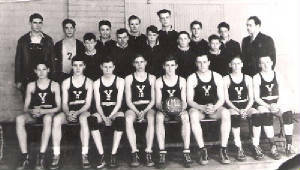 The team of the 1940-41 school year won the school's only District title. Information on the 1941 Champs was provided by the Versailles Area Genealogical and Historical Society. RE: The 1940-41 District Tournament Win. "The coach of this team was Nelson Workman, Rupert Brim was the manager. The team members were: Starting players – James Stone, Raymond Bradbury, Bob Sides, Bob Walsh, Bob Wilson, and Harry Clark. Other players on the team – Fred Brown, Lyle Kleinlein, Eddie Stone, Jim Barnett, Rich Aikens, Bill Davenport, Thomas Root, Jr. Foster, Clifford Orr, Bill Glaze, David Foiles, Cecil Pruden and Charles Benson Burgessor. In the victorious game, March 1st, 1941, Versailles pulled an upset by winning the district tournament over Littleton, which was held at Browning school. Quoting the Democrat Message article covering the event, “Coach Workman’s five nosed out the Littleton basketeers by a one point margin to take the classic by a score of 24 – 23.” The others in the tourney, Browning, Littleton and Hersman, had each defeated the Versailles team twice in the season play and everyone knew it was a long shot for Versailles to win the contest. The trophy awarded the successfully proud team was on display in the window of Roy and Fay Stone’s restaurant in Versailles for all to admire. Since the Versailles High School did not have a gymnasium at this date, all home games and practice were held in the Versailles Community Building."